Global supply chains: time for a new deal? Decades of voluntary corporate social responsibility initiatives have failed to deliver living wages, safe factories, or effective protections for workers’ rights to organise and bargain collectively. 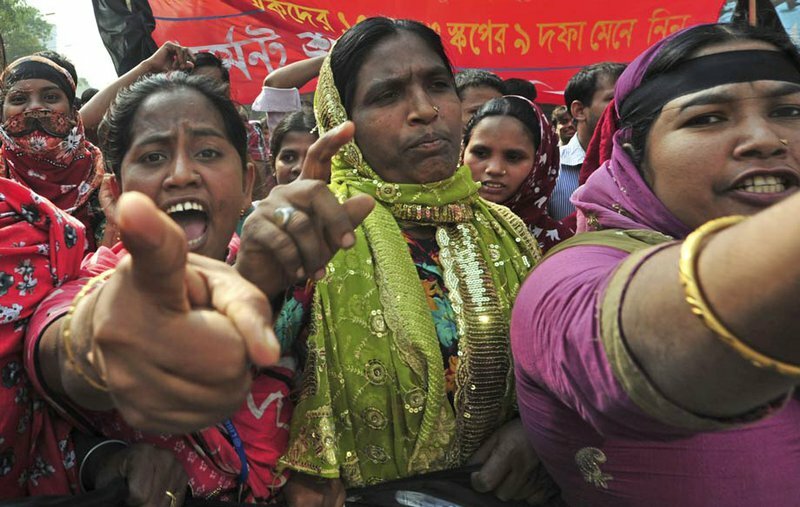 Bangladeshi workers protest on 27 November 2012, two days after a fire in a garment factory in Dhaka, Bangladesh, kills at least 112 people. Khurshed Rinku/Press Association Images. All rights reserved. The International Labour Organisation is dedicating part of its annual conference in Geneva to an important discussion on how to promote decent working conditions in global supply chains. This discussion is long overdue! The tragic collapse of the Rana Plaza building in 2013, repeated deadly factory fires in Pakistan and Bangladesh, and the shocking discovery of ‘modern day slavery’ on Thai fishing vessels, are only some of the examples of the recent events and generally horrible working conditions that make this discussion necessary. We believe that it should start with a clear understanding of what hasn’t worked in the past. Put simply, decades of voluntary corporate social responsibility initiatives have failed to deliver living wages, safe factories, or effective protections for workers’ rights to organise and bargain collectively. In the last ten years alone, more than 1,800 workers have died and thousands more have been injured as a result of the catastrophic building fires and factory collapses which took place in facilities labeled as ‘safe’ by private social audits conducted for major global apparel brands. This alone suggests that the current regime of voluntary and confidential supply chain monitoring is insufficient. In the last 10 years alone, more than 1,800 workers have died and thousands more have been injured in facilities labelled as ‘safe’ by private social audits conducted for major global apparel brands. We’re convinced that voluntary efforts should be replaced with binding initiatives like the Bangladesh Accord on Fire and Building Safety. This accord gives workers and unions a direct role in managing, implementing, and enforcing the relevant standards. Additionally, its transparent reporting mechanism plus the time-bound commitments that it involves regarding factory reforms make it possible to use as a tool for holding big brand buyers legally accountable for their failings. A further issue that ILO delegates should discuss is the fact that the business practices pursued by multinational corporations (MNCs), including paying rock bottom prices to their suppliers and insisting on excessively fast production schedules, inevitably create precisely the labour rights violations that we’re worried about on the factory floor. MNCs dominate global supply chains using their massive market leverage. They demand the lowest prices possible from their suppliers, and suppliers often end up squeezing their workers or cutting corners on health and safety just in order to stay profitable. Rather than wasting their money on ineffective audits, then, MNCs should just pay suppliers prices that are high enough to support living wages and guarantee adequate health and safety protections (as well as, of course, the taxes that could support government regulators and inspectors to protect worker rights). 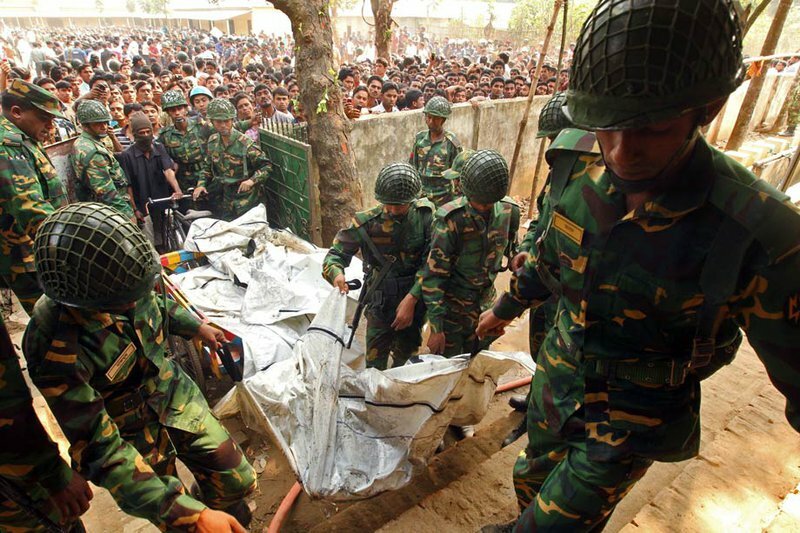 Soldiers carry the bodies of workers who were killed in a garment factory fire in Dhaka, Bangladesh, on 25 November 2012. At least 112 people were killed. Jibon Amir/Press Association Images. All rights reserved. Business analysts often argue that regulatory reforms like these should be evaluated against the risk that these reforms could put employers out of business, leading to a loss of jobs. But this argument fails to account for the potential virtuous circle that reforms can create. For instance, replacing the many bad apple employers who try to under-bid each other with fewer, better employers who pay their workers more, could ensure that workers have more time and money to invest in their own communities. And this, of course, could end up creating more and better jobs. Yet that kind of ‘high road to development’ is next to impossible when global buyers are continually seeking out countries and suppliers which are prepared to offer the lowest possible production costs. UN guiding principles as a roadmap? The UN Guiding Principles (UNGP) on Business and Human Rights provide useful guidance for how to make a positive shift in global supply chain operations through the “protect, respect, remedy” framework. These principles state that we should define corporate responsibility in terms of the impact that businesses have on the world, and not simply in terms of their pre-existing legal liability. They thus imply that businesses should be responsible not only for human rights violations in their own operations, but for all violations connected to their operations by virtue of any formal business relationship. And they lay out a clear model of responsibility for businesses to remedy human rights violations, and governments to protect the rights of workers and their communities. This is a step forward. We are calling on the ILO and its ongoing ILC to begin working towards a binding Convention on Decent Work in Global Supply Chains. The problem with the UNGPs as they are currently conceptualised, however, is that they risk simply creating a new generation of voluntary programmes because they do not define minimum performance requirements or set regulatory standards. This is why we are calling on the ILO and its ongoing ILC to begin working towards a binding Convention on Decent Work in Global Supply Chains. That convention would require member states to regulate the conduct of their MNCs operating overseas and it would require mandatory due diligence to identify any labour rights risks in their supply chains. The convention should also create a permanent dispute settlement facility, housed at the ILO, where MNCs could be held accountable for breaches in existing standards, including the UNGPs and the OECD Guidelines for Multinational Enterprises. The fact that some multinational enterprises have already negotiated contractual commitments, such as the Bangladesh Accord, which include unions and other worker-led organisations in developing supply chain solutions, shows that even global buyers have recognised that what has been tried so far has not worked. Now is the time for the world to seize on this openness to change and to create a more uniform approach to ensuring workers’ rights in global supply chains, one that requires global brands and retailers to absorb the real cost of production for their goods and enables those who have the greatest stake in improving supply chain governance – the workers themselves – to enforce compliance.